We offer a quality group room available for hire in Mascot with client viewing. 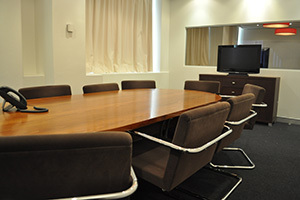 Our Mascot and St Kilda offices boast large rooms suitable for gang surveys and larger face-to-face projects. These rooms can be adapted to run various types of studies e.g. Product taste testing, Shopping experience (with super market style shelving and setup), clinic style interviewing etc. Plasma television, DVD player, other audio, etc.